3Dprintlife has been on the 3D printing market for a long time. For all that time they’ve been selling filament and 3D printers. This time they’ve created something new – the first filament that is designed to be biodegradable. They called it Enviro ABS. We should be concerned not only about development of new technologies, but also about our planet, for it is our home. Jeff Stevens, CEO of 3DPrintlife explained that their aim was to develop a kind of filament that would print well and at the same time be environmentally friendly. They are so glad that their Enviro shows high quality of printing. Enviro ABS is the result productive work of a chemist from Boston and 3DPrintlife. The chemist focuses on producing biodegradable plastic packages. He has already created bio-additives for hospitality and cosmetics industries. COO of 3DPrintlife Buzz Baldwin explained that they had long been talking about the types of plastics used in 3D printing and the possibility of creating biodegradable ABS filament. Nobody could guarantee that it would work, however everyone was concerned about developing eco-friendly filament that could be used in 3D printing. They had spent months experimenting with numerous biopolymers and extrusion lines. Finally they got Enviro. The company ensures that Enviro ABS provides good quality of prints, precision and dimensional stability. For example, Stephen Conley, Sierra Resins founder, states that he was surprised be the quality of Enviro ABS. They’d spent nearly five years experimenting with materials carrying out various tests. At last their effort resulted in this marvelous 3D printer filament. 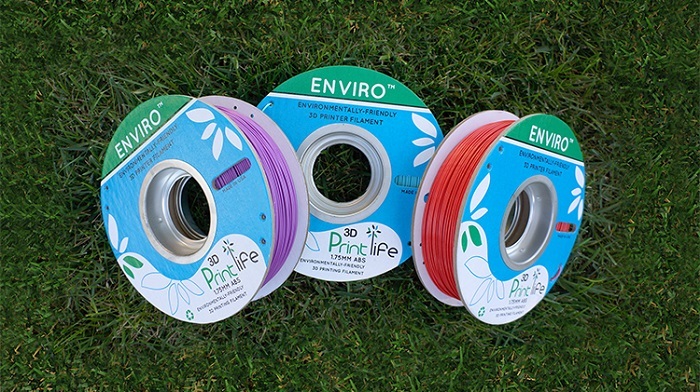 3DPrintlife has developed not only the filament, but also eco-friendly packaging and spooling that go with the filament. 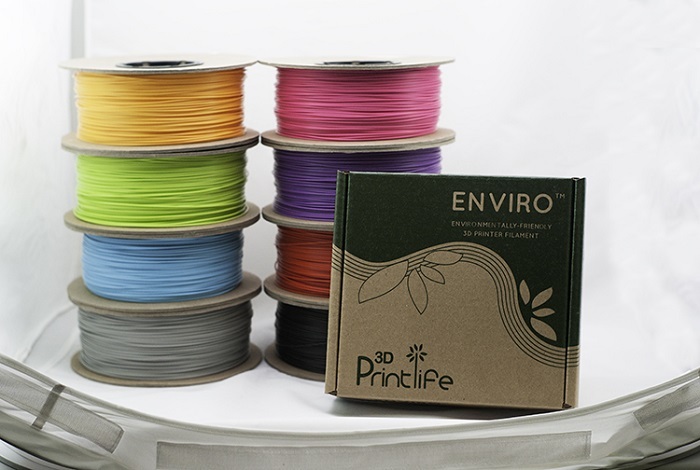 The spool is made of recycled cardboard and the filament is kept in re-sealable plastic bag. On both sides of the spool there are double holes for the safe filament strand. The company designed the spool in such a way that it fits nearly any 3D printer available. It is common knowledge that ABS is anyway petroleum based. But the Enviro contains bio-additive to which the bacteria are attracted. As soon as the bacteria start to take in the additive, it will move and devour the ABS. That’s how it degrades. But you shouldn’t think that it will happen everywhere where there are bacteria. It is some special kind of bacteria that you need, like those in leachate or a landfill. One of the Dutch scientists suggested an alternative way to provide ABS without more petroleum – to re-use ABS from car scrapyards and landfills. 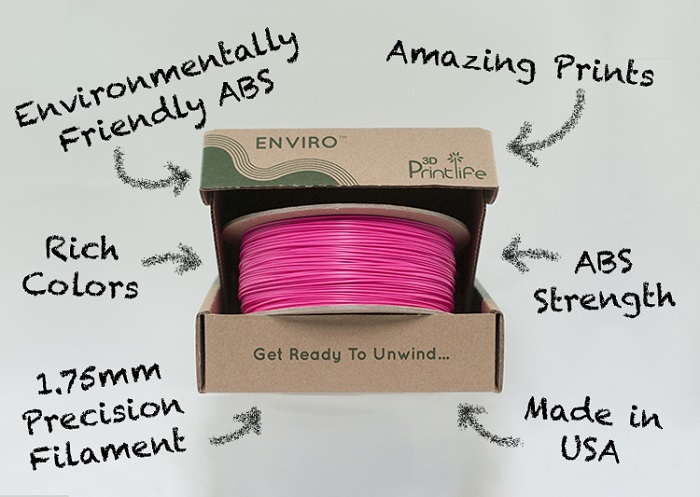 3DPrintlife is really concerned about the environment, and this product proves this. Furthermore, the company will donate every $1 from each sold Enviro ABS to the Nature Conservacy’s fund “Plant a Billion Trees”. The fund plants trees in major forests all over the United States. And above that, each material spool is supplied with a piece of “seed paper”. You can put it into some vessel with water and cover it with loose soil. It will start to bud and wildflowers will fill your garden. You can buy it online from the 3DPrintlife website. Each spool is available at $49.99. Enviro ABS is suitable for those who are looking for ways to 3D print and not to do harm to the environment. New to 3D Printing? Check out our 3D Printing basics section, find the answer on popular question what is 3d printing or what types of 3d printers exist, and learn about many other interesting things. Or visit all over the United Statesd printers catalog to find 3d printer price and general information from many manufacturers.